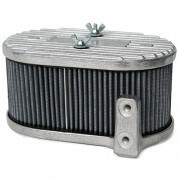 To ensure that your VW air cooled engine is running perfectly, it is important that a quality air cleaner is fitted to your carb. RPR supplies a range of air cleaners and associated parts and accessories. Complete ready to bolt on air cleaners with all of the necessary parts. Elements for your air cleaner for Type 1, Type 2 and Type 3. Parts and accessories for your air cleaners.